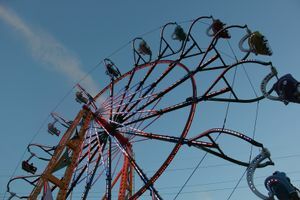 The Williamson County Fair will be from Friday, August 3rd through Saturday, August 11th at the Williamson County Ag EXPO Park from 6pm - 10pm each night. This years theme is "Country Pride, County Wide". New attractions this year include Ma’Ceo, an equestrian acrobatic show that will take place inside a large tented area in the Fair Village. Ma’Ceo will offer two shows per night during the week and four shows daily on the weekends. The exhibit will feature various and exotic breeds of horses on educational display between shows. For a limited showing, the Jurassic Kingdom Dinosaur Show will take place in the covered warm-up area for the first five nights of the Fair. The interactive demonstration will include a hands-on look at ancient fossils and appearances by various dinosaurs, offering a mix of entertainment and education. Fair favorites will continue like the Little 1’s Farming Exhibit, Children’s Barnyard and 4-H & Youth Village with interactive, free activities for children that are focused on health, STEM, robotics, engineering, horticulture, wildlife, animal science, culinary arts, and much more. All attractions are FREE with admission. For more information: www.williamsoncountyfair.org.